In light of the vision to practice and promote optimism, a group of visionaries came together to spread good vibes in their daily activities, no matter how simple or mundane a task may be. Sending Good Vibes is a voluntary organization that was formed with the mission to counter the paradigm of negativity and spread optimism and hope to people nationally through various humanitarian efforts. Last May 12, 2015, the media friends and bloggers were treated to a preview of its one-of-a-kind initiative to spread good vibes and light up the fire of peace-keeping and goodwill. 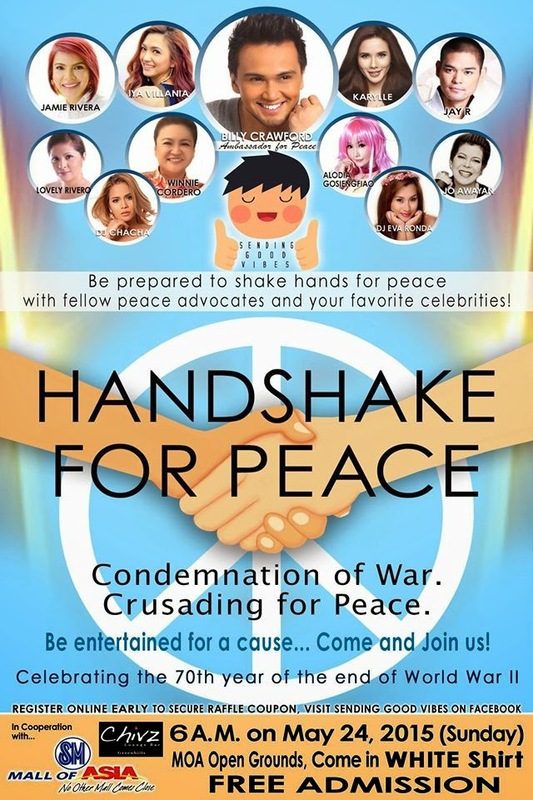 The launch was held at Chivz Gastro Lounge in Greenhills, San Juan, where the group showcased their primary intitative - Handshake for Peace. Set to celebrate the 70th year of the end of World War II, this event aims to bring people together and help them realize how much change they can make by simply spreading good vibes to their friends and families everyday. Led by today’s brightest stars, among whom are Billy Crawford, Iya Villania, Karylle, Jay-R, Alodia Gosengfiao, Jamie Rivera, Lovely Rivero, DJ Cha Cha, Winnie Cordero, DJ Eva Ronda and Jo Awayan, the event hopes to gather crowds at the Mall of Asia Open Grounds on May 24 as early as 6:00 in the morning for a day of celebration and giving of good vibes. Everyone will receive a cap as a symbol of unity and peace. More surprises await the participants. The event is until around 10:00 am only. So be there early so you won't miss the fun! A program consisting of different entertainment, games, and activity booths will be set up to keep spirits high. Admission is free and the public is encouraged to come in white shirts to show their support for this momentous ocassion.